Dragons are all of these things. Using their magics, the Seven great Dragons sealed the old Ones beneath the earth, forever sleeping, so that mortals may have a chance at living a free life. The oldest of the races, Dragons have been around since the Ancients gave birth to the Old Ones. It is not know where they came from, or why they came here, they just were. Dragons, after the sealing of the Old Ones, broke into Seven Clans; each under the leadership of one of the Great Dragons. These Clans monitor the world, making sure the Old Ones never reawaken, and guarding the mortals that the Great Dragons saved. However, in the fifth century after their sealing, the Old Ones awakened. Noone knows how, or why, but the resulting Cataclysm shook the world, resulting in the near-exticntion of the Dwarves and the elimination of the Dwarven Empire. Remnants of the Old One's reawakening still lie scattered around the world, from ancient bastions of the Undead to deep caves filled with dark tidings that seem to consume anyone that go near. Vowing to rid the world of the evil, the Dragons have ventured forth from their caves and have set out to destroy the evil of the world themselves. 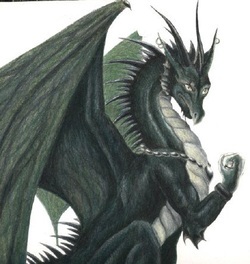 Dragons have the ability to transform themselves at will into a humanoid shape, although they still have many features of a dragon, including wings, spikes, and a tail. This form allows them to walk through the mortal races unhindered, and without causing damage. Dragons gain an additonal +1 SR + CON and +1 PR + CON in Dragon Form, and gain a 1d6 x STR claw attack. however, while in Dragon Form, their movement is reduced to .25. Dragon form cannot use armor or weapons. Their attack also has a 25% chance of missing. Racial Bonus: +2 WIS +1 INT +2 CHA +3 HEALTH, -2 SPD, -2 Abilities on Game Start.